On October 30, tragedy occurred in Indiana when a woman failed to stop for children crossing the road to the bus. The bus had all of its lights on, and the woman had time to stop. However, in her statement, she said that she did not see the children or the stopped bus. Witnesses, including the driver in the following car and the bus driver, state that the bus was clearly visible. Regardless of whether or not the driver could have stopped, the end result is that three children are dead. This tragic incident has started a dialogue regarding bus safety and increased awareness of children crossing streets. 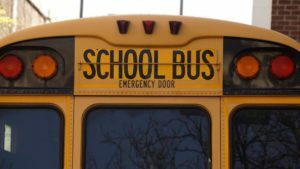 While the laws regarding passing school buses do vary from state to state, nearly all state that you must stop when approaching a bus that has its flashing lights on and stop sign extended. There are some exceptions, such as when you’re driving the opposite way and there is a barrier on the median. However, in most cases, you must stop when the school bus is picking up or dropping off passengers. Always be aware of school buses on the road, especially in the morning and around the time school lets out. Watch for children at designated bus stops or on the sidewalk near homes. These children may step out into the street before a bus has come to a stop or has its lights on. Likewise, watch the street whenever you see a bus has been stopped, even if its lights are no longer on and the stop sign is no longer extended. Children may have just got off the bus and are preparing to cross the street. Above all, slow down and carefully watch for lights if you’re driving in any low-visibility condition.